ms. brown's classroom: Welcome to my world! Welcome to my new blog, Ms. Brown's Classroom. I'll be using it to help inform the parents of the children in my classroom what we're doing. (For readers who aren't parents of current students, I teach split classes of Junior and Senior Kindergarten Students in Toronto, Ontario, Canada. I may have 3, 4 and 5 year olds in the class! There is a morning class, currently with 20 students, and an afternoon class of 16). Over the next few weeks, I'll try to give you an overview of our kindergarten day. I'll be explaining what "centres" we have in the classroom, and what we do in the centres. I'll also try to give overviews of what we are working on each week. I'll show what books we are reading (and why we are reading them). I'll show our poems and list our songs. I'll show our math and science activities. I'll show some writing examples and I'll explain how to interpret them. And of course, I'll be showing lots of art! 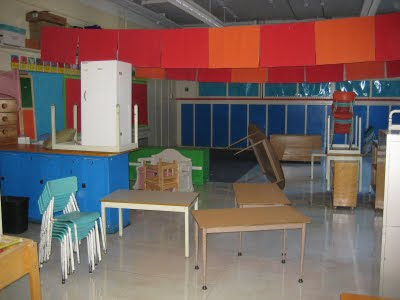 Arriving at school at the end of August, I met this pile of furniture! Even now that the furniture is all set up, the classroom still seems empty. It only comes to life when the children are there. Unfortunately I won't be showing pictures of the students in this blog, but I will show their work. Parents, you will be able to see pictures of your children doing many activities in this classroom when we meet in person on Open house night, which I believe is scheduled for Thursday, October 1. If you ask a 4 year old, "What did you do at school today?" They usually say, "I don't know" or "I played". Whle we do have structured teaching time each day, research has shown that young children learn best when they are engaged in play based activities. Please don't let me hear you say, "She's Just Playing." For, you see, I 'm learning as I play.